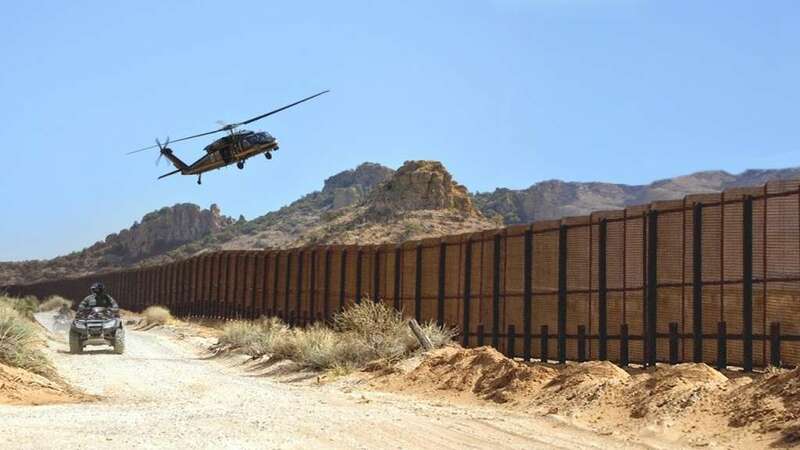 Federal immigration law both imposes the responsibility and provides the means for the Federal Government, in cooperation with border States, to secure the Nation’s southern border. Although Federal immigration law provides a robust framework for Federal-State partnership in enforcing our immigration laws and the Congress has authorized and provided appropriations to secure our borders the Federal Government has failed to discharge this basic sovereign responsibility. The purpose of this order is to direct executive departments and agencies (agencies) to deploy all lawful means to secure the Nationx27;s southern border, to prevent further illegal immigration into the United States, and to repatriate illegal aliens swiftly, consistently, and humanely. (a) “Asylum officer” has the meaning given the term in section 235(b)(1)(E) of the INA (8 U.S.C. 1225(b)(1)). (a) The Secretary shall take all appropriate action and allocate all legally available resources to immediately construct, operate, control, or establish contracts to construct, operate, or control facilities to detain aliens at or near the land border with Mexico. Sec. 6. Detention for Illegal Entry. The Secretary shall immediately take all appropriate actions to ensure the detention of aliens apprehended for violations of immigration law pending the outcome of their removal proceedings or their removal from the country to the extent permitted by law. The Secretary shall issue new policy guidance to all Department of Homeland Security personnel regarding the appropriate and consistent use of lawful detention authority under the INA, including the termination of the practice commonly known as “catch and release,” whereby aliens are routinely released in the United States shortly after their apprehension for violations of immigration law. Sec. 7. Return to Territory. The Secretary shall take appropriate action, consistent with the requirements of section 1232 of title 8, United States Code, to ensure that aliens described in section 235(b)(2)(C) of the INA (8 U.S.C. 1225(b)(2)(C)) are returned to the territory from which they came pending a formal removal proceeding. Sec. 8. Additional Border Patrol Agents. Subject to available appropriations, the Secretary, through the Commissioner of U.S. Customs and Border Protection, shall take all appropriate action to hire 5,000 additional Border Patrol agents, and all appropriate action to ensure that such agents enter on duty and are assigned to duty stations as soon as is practicable. Sec. 9. Foreign Aid Reporting Requirements. The head of each executive department and agency shall identify and quantify all sources of direct and indirect Federal aid or assistance to the Government of Mexico on an annual basis over the past five years, including all bilateral and multilateral development aid, economic assistance, humanitarian aid, and military aid. Within 30 days of the date of this order, the head of each executive department and agency shall submit this information to the Secretary of State. Within 60 days of the date of this order, the Secretary shall submit to the President a consolidated report reflecting the levels of such aid and assistance that has been provided annually, over each of the past five years. Sec. 11. Parole, Asylum, and Removal. It is the policy of the executive branch to end the abuse of parole and asylum provisions currently used to prevent the lawful removal of removable aliens. Sec. 12. Authorization to Enter Federal Lands. The Attorney General shall take all appropriate steps to establish prosecution guidelines and allocate appropriate resources to ensure that Federal prosecutors accord a high priority to prosecutions of offenses having a nexus to the southern border. The Secretary shall, on a monthly basis and in a publicly available way, report statistical data on aliens apprehended at or near the southern border using a uniform method of reporting by all Department of Homeland Security components, in a format that is easily understandable by the public. Except as otherwise provided in this order, the Secretary, within 90 days of the date of this order, and the Attorney General, within 180 days, shall each submit to the President a report on the progress of the directives contained in this order. The Office of Personnel Management shall take appropriate action as may be necessary to facilitate hiring personnel to implement this order. Posted in Announcements, CBP, Executive Order, immigration, Immigration policy, USCIS. ← Joint Motion to Reopen Granted!